A unique event in Greater Puget Sound/Seattle, Washington celebrated and uplifted brain cancer patients and survivors providing inspiration, food and fellowship, massages, gifts, photography sessions, and more. The EndBrainCancer Initiative Initiative recently hosted its first ever GBM Patient & TOGETHER Day on Friday, March 15th at the Bellevue Club in Bellevue, Washington. EBCI and its sponsors and partners hosted current and past brain cancer patients, survivors, caregivers, and families in a special event focused on uplifting and inspiring those impacted by brain tumors and brain cancer. The afternoon program flowed with opportunities for participants to dine and enjoy special services such as massages, makeovers, and photography sessions and featured a variety of speakers who shared inspirational insights through stories of their personal experiences with brain cancer. As a new event initiative, GBM Patient & TOGETHER Day enjoyed both local and national underwriting support. National sponsors included Presenting Sponsor, AbbVie, and Silver Advocacy Sponsor Novocure. Local sponsors included The Seattle Cancer Care Alliance (SCCA) Proton Therapy Center, Seattle Children’s Hospital, Research and Foundation, and Comcast Spotlight Seattle. Education and awareness roundtables at the event were underwritten by a grant from Genentech. Opening the program, Dellann Elliott Mydland, president and co-founder of the EndBrainCancer Initiative, sounded a theme of celebration and hope addressing the patients and caregivers present, “Today, we’re here to celebrate you!” Various brain cancer patients and survivors were introduced including Sam Staatz, a 20+ year survivor of brain cancer, also a patient survivorship ambassador with the EndBrainCancer Initiative. The event highlighted women leaders in the Puget Sound area who have been personally impacted by brain cancer. Julie Prince (Wealth Management Advisor, Prince Financial Services, Northwestern Mutual Wealth Management Company) described the heartbreaking experience of walking beside a colleague who contracted GBM brain cancer, but also the “silver lining” in how that person resisted a two week prognosis and went on to travel and seek out advanced treatment and trials and build lasting memories for her children, living a full year longer than expected. 2019_GBM_TOGETHER_DAY_Post_Final The event included two panel discussions with speakers and several breakout sessions with patients who gave input about their needs, direction of research, and important priorities. EBCI also presented its first “What Empowers You” Award to the 2019 (EBCI plans to present two of these awards this year) winner, Robert “Alec” Swayngham who was on hand with his wife, Barbara, visiting from Alaska. Alec’s story stood out after review of many nominations of brain cancer patients who shared stories of the ways they are letting their passion lead their lives while undergoing treatment. This 2019 award program is cosponsored by AbbVie and Novocure. Other companies donated (or offered at a reduced cost) resources and services for the event. They include Nieman Marcus offering Jo Malone body products and makeovers using Chantecaille makeup products, The Dream Clinic offering massage services, Charles Cutugno Photography offering portrait photos and prints, and Cavalier Films conducting interviews. 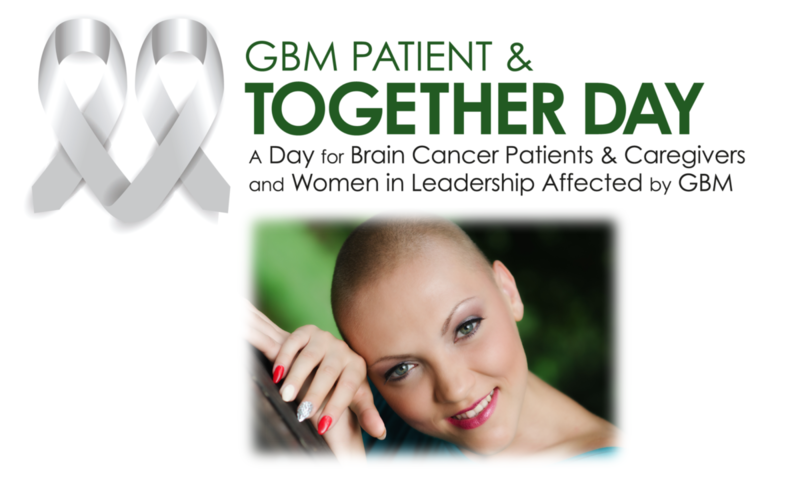 The 2020 GBM Patient & TOGETHER Day will be held on Friday, March 6, 2020. The EndBrainCancer Initiative (EBCI) also participates in a program at the National Institutes of Health (NIH), National Cancer Institute (NCI), Center for Cancer Research (CCR), Neuro-Oncology Branch (NOB) called NCI-CONNECT (Comprehensive Oncology Network Evaluating Rare CNS Tumors). The program aims to advance the understanding of rare adult central nervous system (CNS) cancers by establishing and fostering patient-advocacy-provider partnerships and networks to improve approaches to care and treatment. If we can help, please contact us at WeCare(at)EndBrainCancer(dot)org or 425.444.2215. To support EBCI’s efforts, programs, and services, provide a gift today at http://www.endbraincancer.org.